I hosted a **workshop on Open Video and Popcorn.js** together with [Henrik Mitsch](https://twitter.com/#!/hmitsch) and [Cole Gillespie](https://twitter.com/#!/theCole). I gave a 15min intro to Popcorn, showed some demos, and then we broke into groups to discuss opportunities with open video (learning, tech, and storytelling). [Sam Figueroa](https://twitter.com/#!/unimatrixZxero) kindly took [notes from the session](http://rplive.de/michelle-thornes-popcornjs-workshop) and the [HTML slides are here](http://michellethorne.cc/wp-content/uploads/popcorn_slides.zip). The following week we **organized a meet-up at Oberholz** to help folks get started on their video projects and perhaps do a regular “open hack” and skillshare around these tools. The team at [Leuphana Moving Image Lab](https://www.leuphana.de/inkubator/digitale-medien.html) has been central to helping get these efforts off the ground. 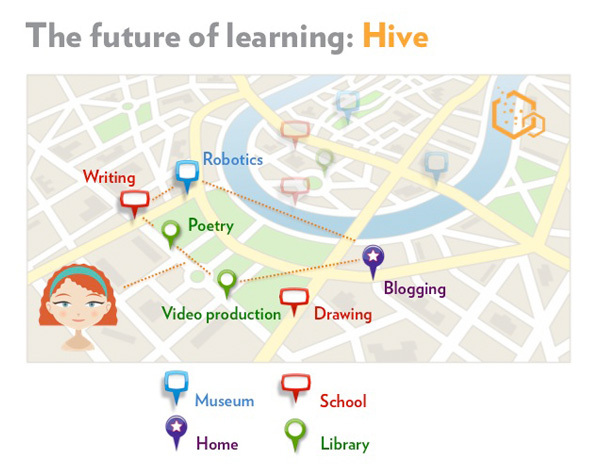 Thanks to the generous invitation [Jöran](https://twitter.com/#!/jmm_hamburg) in the re:learn track, I shared the work being done at [Hive NYC](https://twitter.com/#!/jmm_hamburg), a city network of “learning sites” where you can learn skills and make things with participating organizations. It focuses on **[connected learning](http://connectedlearning.tv/infographic),** experiences which are hands-on, effective, networked and driven by youth’s interests. [Slides](http://michellethorne.cc/wp-content/uploads/MozillaHiveNYC.odp). We’re hosting a **[community brainstorm on May 16 at Oberholz](https://hive-berlin-brainstorm.eventbrite.com/)** to survey what learning initiatives are out there, what we’d like to see in Berlin, and test whether we’d like to try something together. If you’re an educator, a geek, a lover of learning: stop by! It was fun to see fellow bloggers and even recruit a few new ones (hi, Anja and Torsten!). A big thanks to [Nicole](http://antischokke.de/) for stoking the blogging fires and getting us all together. Huge props to the #rp12 team for pulling together an impressive conference. With 4,000 people, a new but fitting venue, and all in all good fun, it was a wonderful experience and definitely the best place to meet up with ze German internets.